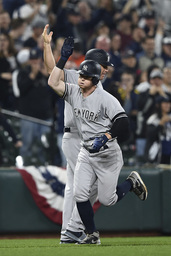 BALTIMORE (AP) After Aaron Judge gave the New York Yankees the early lead with his first two home runs of the season, the pivotal long ball came from an unlikely source. "I just love the fight in our guys," first-year manager Brandon Hyde said. "We've just had a couple tough pitches out of the `pen recently."